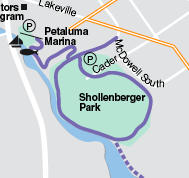 I walked from the Petaluma Marina to all the trails (shown as purple lines on map to right) I could find in Shollenberger Park, including a trail a bit south of the large loop near the Ellis Creek Water Recycling Facility ponds. Lots of birds were out today in the Park. There seemed to be a contest between the little brown jobs and the red-winged blackbirds -- that is, which one was present in the biggest numbers. But, the winner was: the swallows, who had probably built their mud nests under the Highway 101 overpass, and various bridges spanning the Petaluma river and nearby creeks. A live king snake crossing the trail, some large white swans, and a goose family with a two little goslings helped round out the wildlife count for the day. 41 little brown jobs (LBJs); 2 turkey vultures; 2 hummingbirds; 1 white butterfly; 23 ducks; 1 king snake crawling across trail; 52 red-winged blackbirds; 2 doves; 3 unidentified brownish shorebirds; 4 little black beetles; 34 Canada geese; 28 sea gulls; 1 crow; 72 swallows; 3 white swans; 3 killdeer; 14 American Avocets; 1 mosquito; 10 black-necked stilts; (may've seen a brown otter? but can't be sure); and 1 ball.